Monday I went for a run. Needed to get some training in for this duathlon. I was not too sore after it, so some progress there I guess. Wednesday was the weekly high pace mtb spin around 3 rock. It was ok. I was having problems on the very technical stuff, but practice will sort that out. It was a good work out though. Thursday was acupuncture! Decided to try this out after lots of good words from the OH. I'm not entirely convinced on the whole energy lines and such, but did feel pretty good the following day. They also have a form of physiotherapy, so I'll go back next week to get some work done on my IT Band and hamstrings. Friday was another run. I went ok, but I am finding running quite hard. It took me 15 mins to do the 3.2km, so double that for the two running sections and say approximately 40 mins for the 20km cycle would mean the race would take around 1 hour and 10 minutes-ish. Well, we have to start somewhere. Today I did my long road spin. After a really nice week - cold, dry and sunny - I opened the curtains this morning to see a greasy road and a gale blowing. Typical. But I was determined to do this spin after putting it off a couple of times in the past month. It was bacially a spin to Laragh, then turn right and head on the Shay Elliot Memorial drive to Glenmalure. 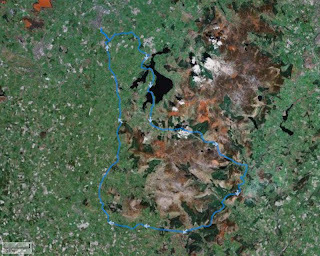 From there is a long climb up Slievemane and back around west Wicklow before hanging a left to home.The spin to Laragh was boring - to be honest I've cycled it so often I'm beginning to dislike that section of road! The only thing that distracted me was the cross wind that turned into a head wind. It really slowed me up, but it was a case of just getting the head down and making it to Laragh. The descent from the Wicklow gap was particularly hairy due to the wind so I just took it handy. From there it was onto the Shay Elliot drive. It was not as bad a climb as I thought it would be. The wind was on my back for most of it, so that helped a lot. The descent was hairy again as its so steep, but I just took my time. As soon as I got into Glenmalure valley, I was climbing back out of it. This was a tough one. The road was pretty steep and I had a cross wind pushing me around also. After 25 mins I reached the top, only to see in the distance my next climb! Another dodgy descent and then back up again, but not as difficult as it looked from Slievemane. From there one it was lots of rolling hills back home. It was one of the toughest spins I've done to date. The distance combined with a lot of climbing and the wind really took it out of me. But I am happy to have finished it. I might be going on an easy mtb spin tomorrow, but depends on the weather and how I feel.